I have been all about Brussel sprouts lately. First it was the maple glazed Brussel sprouts. Then the honey balsamic Brussel sprouts. Now it’s the Shaved Brussel Sprouts Salad with Lemon Vinaigrette. This might just be my new favorite salad. The lemon vinaigrette just adds an amazing freshness to the shaved Brussel sprouts. I could have eaten the whole bowl in one sitting. You have to try this Brussel sprouts salad. It is super easy too! 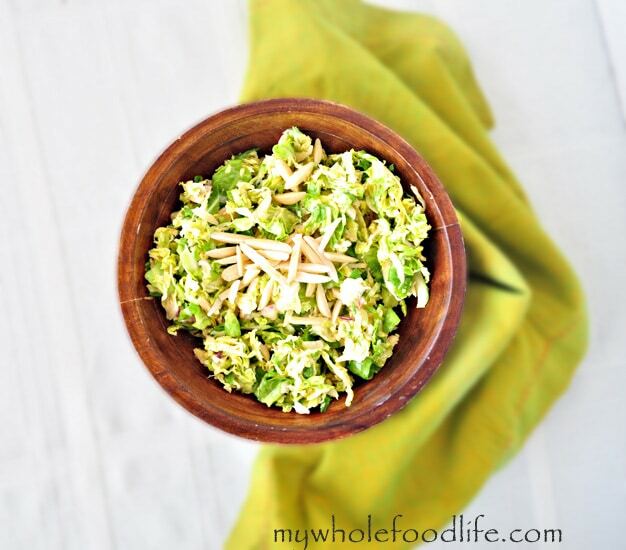 A simple, fresh and healthy way to enjoy Brussel sprouts! To shave the Brussel sprouts, run them on a mandolin or shredder . Add the shaved Brussel sprouts to a bowl with the rest of the salad ingredients. Whisk all the ingredients for the dressing in a bowl. Pour the dressing over the salad and place it in the fridge for 30 minutes so the flavors can marinate. I think the longer this salad sits, the better it gets. It should last 3-5 days in the fridge. Mmmmmm...I LOVE brussel sprouts! I could eat them every day! 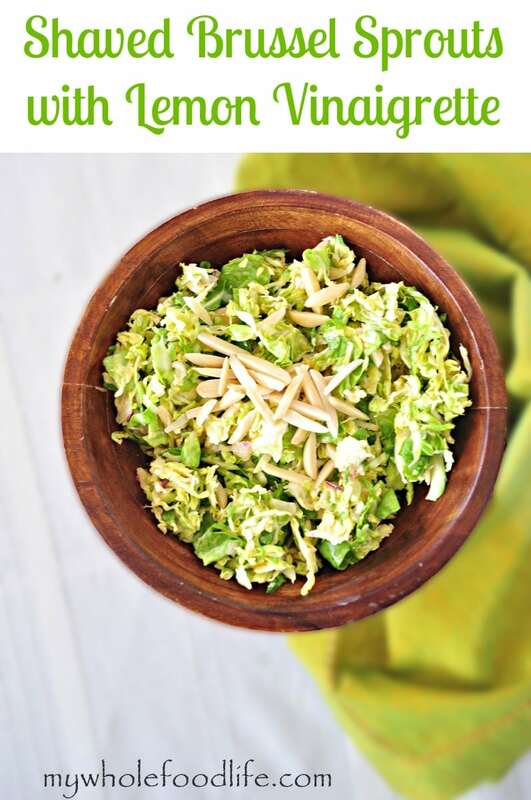 In fact I was eating a quick sautéed brussel sprout lunch when I read this recipe! Since I had the food processor out to do the sautée I finished shredding the bag of brussel sprouts and made the salad in your recipe. It is in the fridge now waiting to be taken to work for lunch tomorrow. The dressing tastes wonderfully lemony! Thanks for another winning recipe Melissa! Lunch was wonderful! I think this is my new favourite salad as well! Yum! I love Brussels sprouts. I've actually never shred them before! I always go the roasted route. This looks great! It's similar to cornstarch. We used to to thicken the dressing a little. If one doesn't have arrowroot powder, could flour or cornstarch be substituted? (Yes, I know my cornstarch is full of GMOs. Baby steps...) Thank you. As soon as I saw this recipe I knew I had to try it. I have everything but the red onion. So I will just try with a little yellow. Can't wait. Yellow will work as well. I hope you enjoy the recipe! This looks so great! It reminds me of a salad that I used to get at Ruby Tuesdays back before I became more health conscious. Can't wait to try this! Thanks Brandy! I hope you enjoy the recipe! Okay...I really dislike Brussels sprouts, but recently have enjoyed them roasted...but this recipe was delicious and lemony! I never thought I would like them raw! Yay! Me too! I only started to enjoy them a few months ago. I'm so glad you enjoyed the salad! I have tried a few Brussels sprouts salad recipe, trying to recreate one I always get at my fave local restaurant. The dressing has always been off, but yours has finally worked perfectly! The addition of maple syrup and the onion powder was just the trick to make it delicious. I added a chopped hard boiled egg and a few Parmesan shavings. It made for a great lunch entree, which I will make again! Thank you for this great recipe. You are so welcome Leslie! I am happy you liked it! It's one of my favorite salads. I'm so glad I found this recipe! Thank you! Last weekend, we were at an exhibit at the National Geographic Museum in DC & Whole Foods was serving a similar recipe in conjunction with healthy eating. When I did a search to find it to make it at home, I couldn't, but, alas, I found yours :) I toasted the almonds, which weren't a part of the WF recipe. And, I added craisins, which were an integral part of the WF recipe. Thank you! Delicious!! So glad you liked it Kim! I bet it was yummy with cranberries! This sounds lovely! I have some brussel sprouts in my fridge, and I've been mulling over what to do with them. This sounds perfect! Thank you Heather! I hope you enjoy the recipe. This was my first time making a raw Brussels Sprout recipe; usually I roast or otherwise cook them. I'm glad I tried it; this is good. It is VERY LEMONY! I love lemon, so it was delicious for me; but it was too much for my husband. I almost left out the slivered almonds, and I'm glad I didn't. I do think this salad needs that bit of fat to be a counterpoint to the lemon. I'm going with walnuts next time; I think that will be good too. Also I was inspired by a previous comment and added raisins to the leftovers the second day. YUM!